Eva and Jim are two of the most loving and heartfelt people I’ve ever met. They have both worked hard to make a good life for themselves and their family and they’ve never showed me anything but unconditional love. I consider them second grandparents of sorts and I couldn’t be more fortunate to have them in my life. When they asked me to officiate a ceremony for them as they renewed their wedding vows after 44 years of marriage, I was so happy to accept. Since they live close to Portland, I decided to schedule a Healthy Habits workshop during the same weekend. After I presented the workshop in Mt. Tabor Park, I drove north to their home in southwest Washington state. Jim is a bronze sculpture artist and their home is surrounded by and filled with his absolutely stunning works of art. 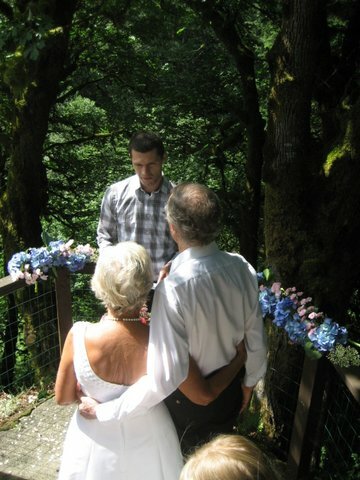 We were fortunate that it was a beautiful day so we were able to have the ceremony outside on a bluff behind their house which looks down into a beautiful valley. Eva even wore the original dress she was married in! The ceremony was intimate and love-filled and their closest allies were there rooting them on. What a true expression of beauty. May we all experience a love like theirs.